President Maithripala Sirisena yesterday directed all Ministry Secretaries to abide by the previously issued circular on appointments of Chairman,Director Boards and Members to government corporations, statutory boards and state owned enterprises. The circular bearing number PS/PCMD/19/2018 was released on December 31 2018 and it directed that all appointments could only be made in accordance with the recommendation of a special committee appointed for the purpose. Senior Presidential advisor, W.J.S.Karunaratne, two representatives nominated by the Prime Minister, and a representative of the Finance Secretary. The President directed all secretaries to send in their respective nominations to the above committee. The above was discussed when the President met all secretaries at a meeting held at the Presidential Secretariat yesterday. He further remarked that with no proper records kept on the vehicles owned by the government, various irregularities were taking place. And thus he directed the Finance Ministry to work together with the Transport Ministry to work out a programme to centralize all information and maintain records of such vehicles. He also asked that this database put online so the public can access it freely. The President also pointed out the importance of all secretaries to visit all relevant institutions under them at least once a month to review their progress and to discuss any issues the staff may have. He also asked that all ministries participate in the national drug prevention programme and every ministry needed to establish their own drug prevention unit and work according to the circulars issued with regard to it. The Grama Shakthi programme initiated to help the people beat the cycle of poverty, is set to be further widened in future to make it a peoples movement and the President asked for the cooperation of all ministry secretaries and government officials for this programme. He also asked that they do their duty and help the government achieve all its development programmes by 2020. A meeting between the President and Secretaries. 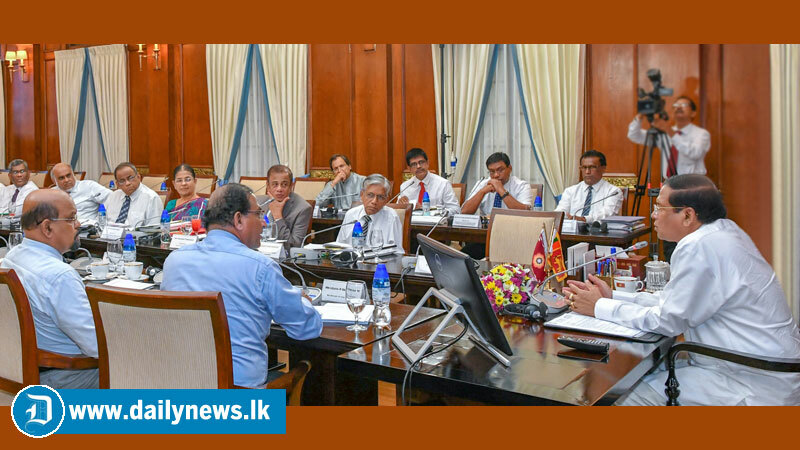 A discussion between the President and the Ministry Secretaries was held yesterday at the Presidential Secretariat.